With the Los Angeles Lakers trailing by five to the Boston Celtics with 1:40 remaining in game five of the 2010 NBA finals. Phil Jackson called a timeout and attempted to motivate his team by channeling his inner Confucius and giving this fortune cookie type of NBA tidbit. This statement is true as to how the injury riddled Celtics played during the regular season, but this has not been the way that a healthy Celtics team has played in the 2010 NBA playoffs nor the NBA finals. Boston went on to discredit Phil’s statement by beating the Lakers 92 to 86 in game five of the 2010 NBA finals, taking a 3-2 lead in the series with game six and if necessary game seven to be played in L.A. Throughout the night the Lakers had been getting out played and out coached by Doc Rivers and the Celtics. It was your typical Lakers performance where Kobe Bryant was doing any and everything he wanted as the rest of his teammates and Phil Jackson just sat around and watched. L.A. looked as if they were playing in slow motion during the entire game. The Lakers played with no sense of urgency or energy; they let the Celtics get to loose balls and deflect entry passes, and allowed the Celtics to score on lay-up after lay-up. Rajon Rondo, Kevin Garnett and at times Nate Robinson did what they wanted to do anytime they felt like it, along with Paul Pierce finally having a breakout game by contributing with 27 points of his own as L.A. couldn’t find a way to stop him no matter who was guarding him. As L.A.’s championship hopes and dreams were becoming a nightmare, the last thing Phil needed to be doing was dropping words of ZEN wisdom to his team. Instead, Phil should have been drawing up plays and finding ways to get other players involved. Not all players respond to the same type of coaching. That Zen stuff may work on Kobe or some of the other guys on the team, but some may just tune it and Phil out and probably already have. I and many other people have always questioned Phil’s ability as an NBA coach. I have felt that he is a great leader of men and a great motivator, but as an X’S and O’s guy he leaves much to be desired. 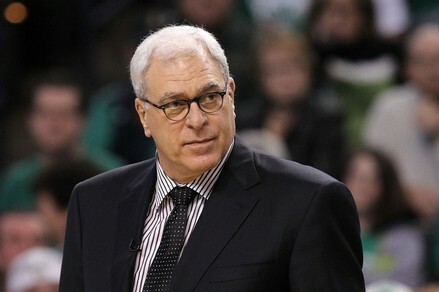 The fact that the vaunted triangle offense doesn’t even have a playbook and it’s an offense based on principles makes you wonder even more as to how good Phil is at drawing up plays. He may have won ten NBA championship titles as a coach in the NBA, but with the talent that he has had on many of his championship teams. Who couldn’t have done what he has done? One of the major problems with the Lakers is that they seem to think that all they have to do is show up and they will win games. The lack of focus, motivation and discipline is what has plagued this Lakers team for years. The Lakers are a microcosm of what our society has become. Hardly anyone these days believes in working for anything, most people are always looking for some get rich quick scheme or trying to find the easy way to become successful in life. As the Lakers are finding out in this year’s NBA finals. Art often imitates life, and unlike last year, you can’t just roll the ball out on the court and expect to win. With the series headed back to L.A., the Celtics are going into game six playing with house money with two games left and only needing to win one. While the Lakers have to win both games if they want to repeat as NBA champions. After game four I mentioned that the key to the Lakers hopes of repeating as NBA champions is Andrew Bynum. If people didn’t realize what I was saying after game four, I am sure that people can see what I meant after what happened in game five. To be honest thought I don’t think a healthy Bynum would have made a difference last night. L.A. just played uninspired and undisciplined basketball in every phase of the game. If the Lakers don’t get Kobe some help which they didn’t do last night, or wake up and play with a purpose. The Lakers will have lots of time during the summer to ponder what happened and agonize over how close they were to winning it all.